Barely a week into 2017, we are already seeing some of the trends we predicted would be huge this year at play IRL. Since fashion bloggers are definitely ahead of the curve when it comes to styling, brands, and the like, trusting their judgment (and taste) is always a good idea. So far, 2017 is looking like a good year for the ladies ahead as they rock some of the season's freshest trends like it ain't no thang. Maybe it's their styling techniques, maybe it's the trends themselves, or maybe it's just us, but we've never seen preppy plaids, '80s glam, and costume jewelry pieces look so good. To be quite frank, we really can't wait to test out the 2017 trends for ourselves. Are you ready for your most stylish year yet? Keep reading to see which 2017 trends fashion bloggers are already wearing and then shop their looks. On Courtney Trop: LNA Tie Back Bodysuit ($116); Acne Studios Patchwork Pattern Skirt ($216); Vetements Black Utility Belt ($690); Valentino boots. Trust us—you'll wear this under everything. We wouldn't be surprised if this skirt sold out by tomorrow morning. 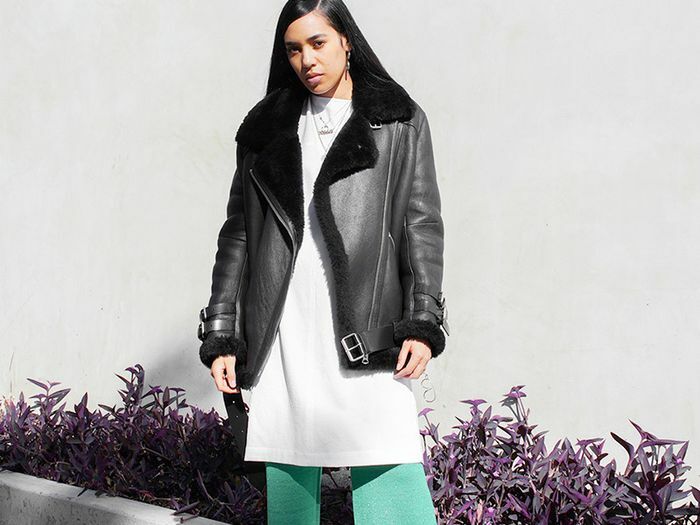 Vetements is a necessary evil in the world of fashion. Because your other black boots are probably worn down. On Reese Blustein: Vanessa Mooney The Astrid Knotted Tassel Earrings ($45); Champion + UO Logo Long-Sleeve Tee ($39); Axel Arigato Clean 90 Sneakers ($225). This new collab is so good. You can never have too many pairs of black skinny jeans. Everyone in the Who What Wear office is obsessed with this sneaker brand. On Aleali May: Public School New York coat; The Line by K by Karla Deras bodysuit; Public School shorts; Alexander Wang Selma Boots ($297). Ultra cool and on sale? We'll take it. Never underestimate the power of a little mesh. Step outside the box and opt for these long shorts instead of a skirt. On Camille Charlie: Marques'Almeida turtleneck and Checked Flared Trousers ($358); Tory Burch Croc-Embossed Mini Backpack ($495). This neckline is so good. Look at that little bow on the waist! Mini everything is always cuter. Sara Escudero: Vintage T-shirt; Zara Sequinned Midi Skirt ($36); Golden Goose Superstar Satin & Suede Sneakers ($480). Everyone will be asking you where you got this shirt. Proof sequins aren't just for NYE. Ah, the beloved sneakers of the fashion world. On Pandora Sykes: Sarina Suriano Ad Astra Earrings ($295); Étoile Isabel Marant Janey Checked Linen Blazer ($530); Gucci Appliquéd Distressed Printed Cotton-Jersey T-Shirt ($590); Frame Le Skinny Jeans ($215); vintage Margiela boots. These plus a graphic tee equals perfection. Another preppy plaid piece to add to your wardrobe this spring. The more we see this shirt worn by bloggers, the less intimidating the price becomes. A wardrobe basic at its finest. On Saray Martin: Chanel bag. From the sleeves to the belt to the ruffle, there is nothing we don't love about this coat. You'll want to live in this denim jacket. Wear this shirt when you need a pop of color. Long live Mother and its frayed denim. These would look great with a pair of fishnet tights. On Gabi Gregg: Rue 21 tunic. The seam down the middle is so flattering. If you haven't heard about this shoe brand, study up. On Taylr Anne: Leo and Sage Woven Flannel Long Jacket ($395); H&M turtleneck; Zara jumpsuit; The Hexad AVA Tote in Mars Red ($229); Darner Caramel Roses Mesh Socks ($38). We love the many ways Taylr Anne styles this coat. Another great sale piece you'd be crazy to pass up. The ways you could style this sweater are endless. Bet you didn't know you needed romantic floral socks until now. The affordable suede booties you've been searching for. Besides unique bags, this brand has incredible jewelry, too. On Aimee Song: Ash Boom Platform Sandals Plum Velvet ($93). If Aimee Song approves, then these are must-haves. Check out this blogger's solution for necklace layering!